Day to day rehabilitation and care at the ADI Spirit of Freedom Rescue Center includes natural diets, vitamin supplements, exercise, veterinary and dental care (including surgery), internal and external parasite treatments and dealing with the many ailments and damage these animals have suffered. Our job is to protect our rescues from harm and bring them to optimum health for their journey while we process their paperwork for export. Our work is not done until we have seen that each and every animal is placed in a secure, permanent home. A challenge arose when following two months of observations, our veterinary team advised against 25-year old Cholita being placed on an international flight, due to breathing problems and a worrying stress reaction. Frail and towards the end of the normal life span for her species, we were not going to take any chances with Cholita’s health. As there was no home already available in Peru, ADI proposed to wildlife officials that they allow us to find and build a home in her native land. A long search brought us to the wonderful Taricaya Ecological Reserve and Projects Abroad, on the edge of the Tambopata Reserve in the Amazon cloud forest, the natural range of Cholita’s species. A perfect home, climate and environment, Cholita could have a piece of rainforest. Late August found us traveling across the Andes on a three-day journey to take Cholita to her new home in her native land (see Cholita’s story). Accompanied by Mufasa the puma, James the Military macaw, three woolly monkeys and two spider monkeys, our little group travelled well. 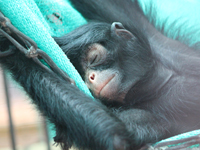 The two spider monkeys may be capable of surviving in the wild; they may be rehabilitated to go free with one of Taricaya’s wild release groups. Since Cholita has been separated from her own kind for all of her life, we are building extra habitats with Taricaya and Projects Abroad, so that Cholita can have bear neighbors. We are gratified that of the majority of the nearly 100 animals we’ve rescued, have or will be returned to secure enclosures in their native environments. It became clear that there were issues of concern with operations at the sanctuary in the US where we had planned to take the African lions. We felt that some operational developments were not in the best interests of the animals. In this particular rescue, we have a high number of elderly animals including those with sight difficulties. These older and special needs animals would not do well in a cold climate and need special care, so we concluded we needed to find a better home, closer to their natural climate and habitat. As with Cholita, this challenge turned out to be la lucky break for the lions. After a long search, we found the perfect home – a sanctuary for large cats – in their native Africa! The lions are going home! 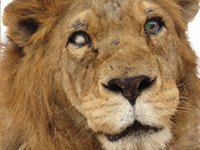 Help take Joseph and the lions home to Africa! Now, we face the greatest task of the rescue operation – all 33 African lions on one aircraft non-stop Peru to South Africa. The flight is planned for October or November 2015, once import and export permits and fencing are completed. These 33 former circus lions have endured so much pain and suffering in their lives, but now they are heading to huge natural enclosures at Emoya Big Cat Sanctuary in South Africa. Set in over 12,000 acres on a secure private estate in Limpopo Province, the Sanctuary is already home to rescued lions and tigers living in pristine African bush – real lion country! Emoya has a no-breeding policy and is not open to the public. It is a wonderful, perfect home. We will be building enclosures for each family group – at least 12 separate enclosures – as well as ‘special needs’ habitats. Final building costs are expected to be around $200,000 plus ongoing costs of lifetime care. The lions were all born in captivity and can never return to the wild. Most have no front claws (as the digits were cut off by the circus) and their teeth have been smashed. They cannot hunt. There are no sanctuaries in Latin America for these animals and the policy of the governments enforcing these laws is to encourage support for their native wildlife, so they want the exotic wildlife removed from the country. A cargo charter is the most economic and least stressful way to take the lions back to Africa – a non-stop flight across the Atlantic, Lima to Johannesburg. We have built our travel crates. The ticket home to Africa for each lion will be approximately $10,000 (like a first class ticket across the Atlantic!). Please donate today. Let’s get them home.